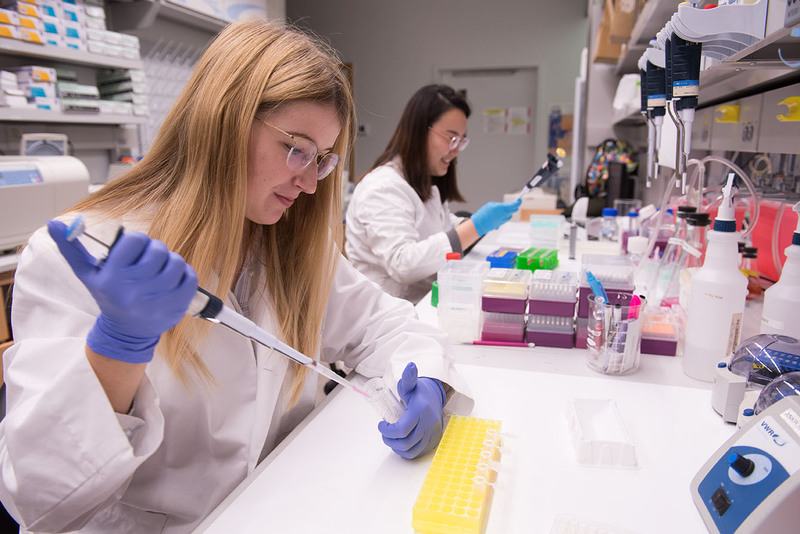 Lin Di and Hannah Dobroski do research in James Ankrum’s lab in PBDB. Di is a fifth-year undergraduate from Hohhot, Inner Mongolia, China graduating in December 2018 with a BS in Engineering. Dobroski is a fourth-year undergraduate from Bettendorf, Iowa earning a BS in Engineering. Kirby’s most recent efforts are the creation of new undergraduate seminars on research, which the ICRU steering committee—made up of faculty from numerous disciplines—helped design. He says that many students don’t consider research when they envision their college career, and he wants to help them see that research is within everyone’s reach because it involves asking questions more than filling test tubes. Even before he became the ICRU director in 2006, Kirby has connected undergraduates with faculty looking to mentor students in research. His many success stories include James Ankrum, a UI assistant professor of biomedical engineering, who first met Kirby in 2003 as a 17-year-old high school student touring campus. Ankrum came to the UI from Eldora, Iowa, and was inspired by his father’s back pain to study the effects of large machinery vibrations on the human body, attempting to discover whether people who drive cars, trucks, or tractors all day suffer any negative effects. He went on to receive a master of philosophy at the University of Cambridge and a PhD at the Massachusetts Institute of Technology, after which he returned to the UI and now conducts research in the Fraternal Order of Eagles Diabetes Research Center at the UI’s Pappajohn Biomedical Discovery Building. Ankrum supervises five undergraduates, four graduate students, and one postdoctoral scholar as he investigates the possibilities of using live cells as therapeutic agents for people suffering from diabetes. Kirby says about 30 percent of undergraduates at the UI conduct or assist research. According to the UI strategic plan, research is considered a high-impact practice (HIP), which the plan defines as programs that require students to integrate learning across contexts. These programs help students extend what they learn in college to the challenges they may face later in life. The strategic plan also considers service learning, internships, writing-intensive courses, academic campus employment, and other activities, to be HIPs. The strategic plan sets a goal for increasing the number of undergraduates who participate in at least three HIPs before they graduate to 60 percent.